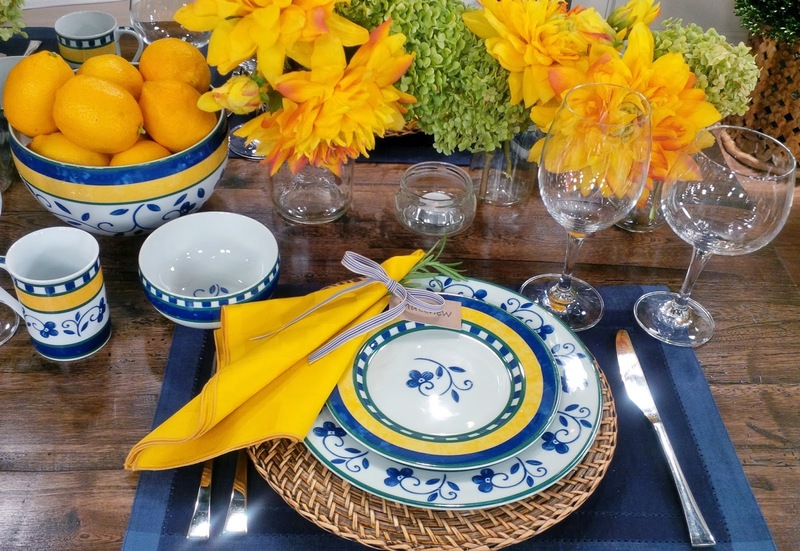 Setting a pretty table, whether for guests or everyday dining, is a part of entertaining that I always enjoy. 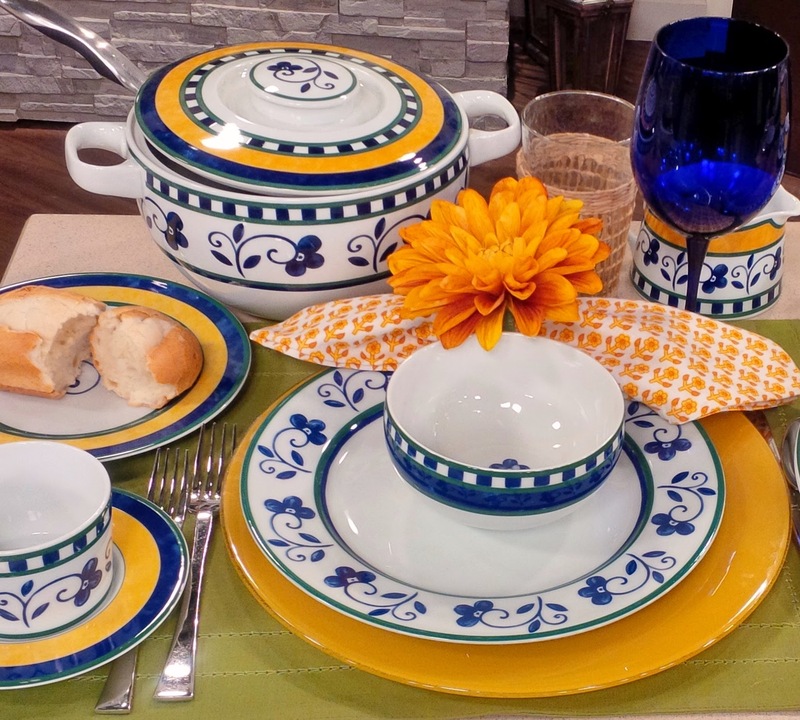 So when I was recently asked by a client to present a European dinnerware set on The Shopping Channel, I was excited ( and nervous ) about the opportunity. How was I going to talk for one hour about dinner plates? And there were 5 live shows to do in one day! 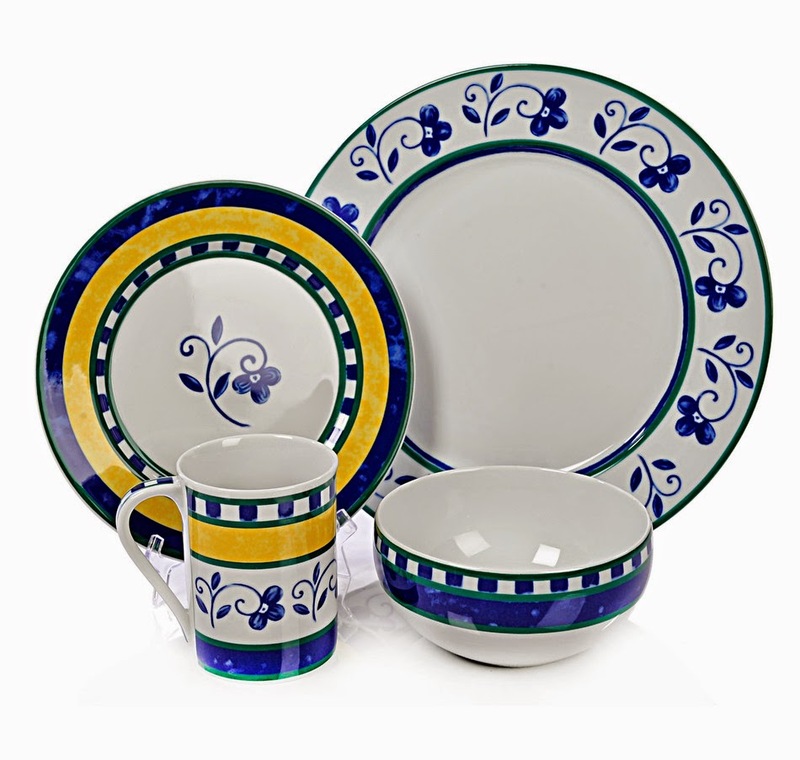 This porcelain dinnerware set is lovely with it's fresh colour palette of blue and yellow. It's a classic look but I was concerned it might not appeal to everyone. My challenge was to create an entertaining show that would appeal to a broad audience and demonstrate how versatile this set actually is. I took my inspiration from the European flavour of the dishes and set a table for dining alfresco. Woven charger plates framed the place setting and created a causal feel for the table. Mason jars filled with gorgeous yellow dahlias lined the center of the table while smaller jars held tea light candles for when the sun set. Yellow napkins tied with ticking stripe ribbon and a kraft paper place card holder added another punch of colour. And a sprig of fresh rosemary tucked into the napkin brought the smell of the garden to the table. A fresh bowl of lemons was the final touch! The table looked beautiful but this was only one look and I wanted to show more. 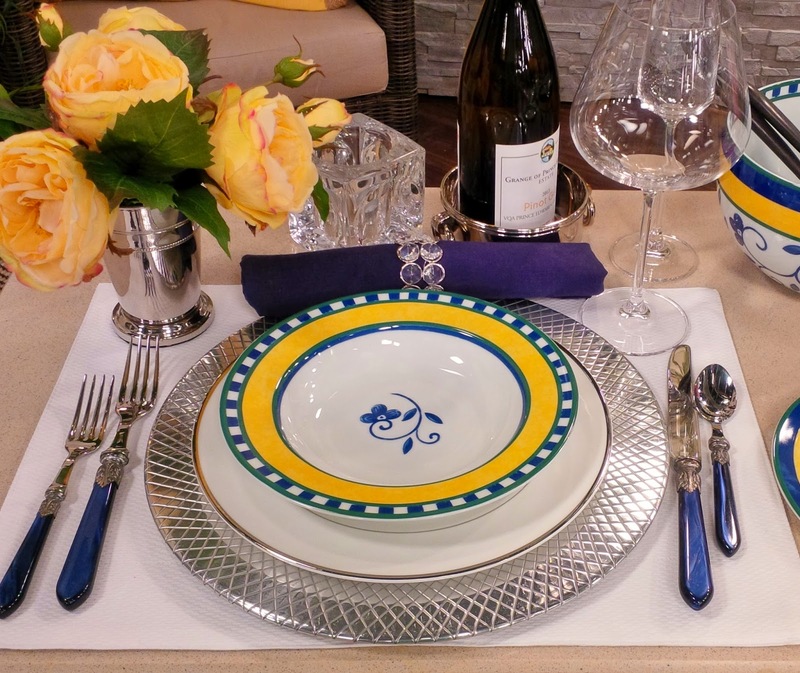 For people who want to set a formal table, the salad plate or rim soup bowl mixes very nicely with a bone china dinner plate featuring a simple silver band. A silver bud vase holds stunning yellow roses and a silver charger plate sparkles on the table. The look is modern sophistication and is anything but boring. But what if you want a change from yellow? Perhaps your garden is full of pretty pink peonies or hydrangeas? Maybe you like a french country look? By using only the dinner plate which has no yellow on it, the look changes completely! 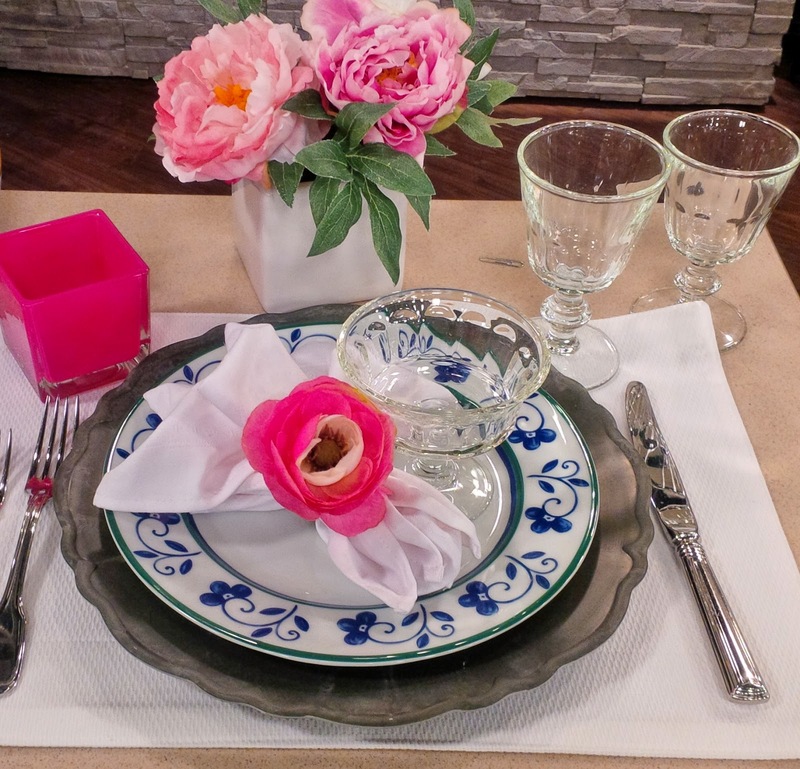 A pewter-look charger plate, scalloped french glassware and pink flowers and accessories look amazingly different. 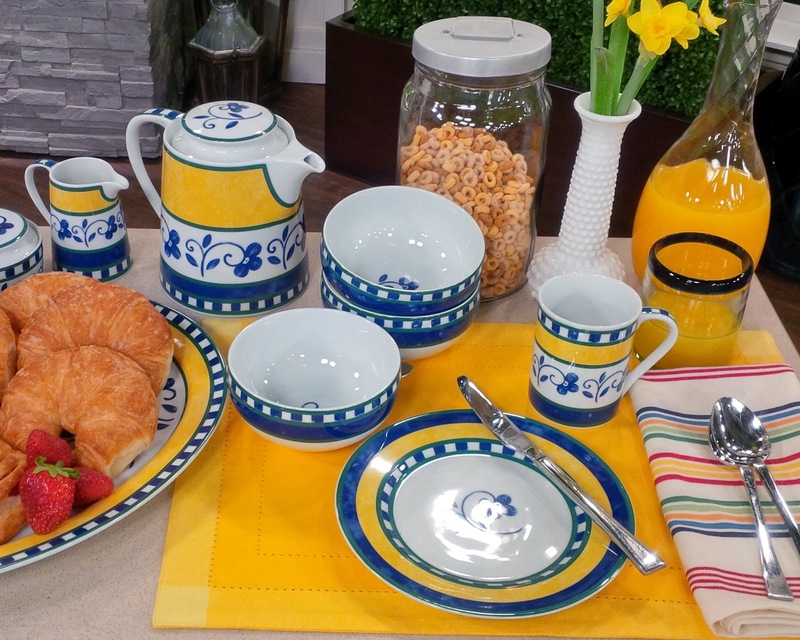 This dinnerware set is also perfect as a breakfast set. What a great way to start the day! You can't help but feel cheery when breakfast looks like this. As the cooler fall weather approaches, heartier foods like stew, chili and soups are part of our menus. The soup/cereal bowl is a great shape for a bowl of chili. And the tureen makes serving at the table easy and attractive. I love the addition of a cobalt blue glass and oversized flower napkin ring. Here's the link to The Shopping Channel to see the complete collection as well as a video from the show. I hope you feel inspired to set a beautiful table for friends and family. Gathering together is what it's all about and taking a little extra time and effort to create a special table setting shows how much you care. Way to go Laurie - you're a natural! Perhaps a new career! Great Job Laurie! You did an amazing job as a presenter, it is like you have been doing it for years! I know it must have been out of your comfort zone, but it did not show at all! !